The 4th of July is a good day to blog about Europe’s "Age of Discovery". This is commemorated in the immense memorial (above) raised in Belem area of Lisbon in 1960 on the 5th centennial of the death of Infante Henry (the Navigator). That is the figure in front holding a caravel. The decay of the Mongolian empire and the subsequent rise of the Ottoman empire blocked the overland trade routes between Europe and Asia. Infante Henry tried to send ships down the coast of Africa to bypass the Muslim kingdoms and open new trade routes east. This was the beginning of Europe’s age of discovery. Islamic scholars had reasonably good maps of the region around the Mediterranean sea and Asia, where their trade links lay. In 1486, Portuguese sailors, under the command of Bartholomew Dias, rounded the Cape of Good Hope. The route to India, and the direct spice trade, was within reach. The Italian seaman, Christopher Columbus, had petitioned the rulers of Portugal and Spain to finance his voyage to open up a western route to India. Estimates of the size of the globe led the Kings’ advisors to believe, correctly, that Columbus had significantly underestimated the length of the journey. 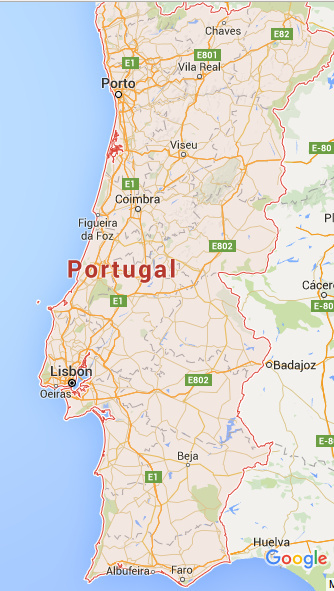 With Dias’ achievement, Portugal was no longer interested in the west. Spain eventually financed Columbus, who serendipitously discovered something new in 1492. By 1494 the two European powers, Portugal and Spain, had divided the world amongst themselves: to the east of meridian 46 degrees west, everything belonged to Portugal, and the west belonged to Spain. By 1498 Vasco da Gama reached Calicut, with the help of a Gujarati pilot. Soon after, during the reign of king Manuel I, the Portuguese voyages of discovery came to an end. By 1513 Balboa and his men had become the first Europeans to see the Pacific Ocean. Spain then financed the voyage of the Portuguese explorer, Ferdinand Magellan, which circumnavigated the earth, and was also the first European expedition to reach Tierra del Fuego and the Philippines. The geometry of the earth conflicted with the political resolution of 1494. Following skirmishes along the Pacific Ocean, a treaty of 1529 divided the earth into two hemispheres for the first time. The hemisphere to the west of 46 degrees west and up to 142 degrees east was to be Spain’s share, and the rest belonged to Portugal. The monument faces out on to the estuary of the Tagus river, through which the ships of the era of discovery passed. A short promenade connects it to the fortified renaissance style tower of Belem (the square tower in the background of the photo above). This was raised as part of the fortification of the river, first against the Moors, and then against Spain. As far as I can tell, it never served its real purpose. The only time it came under attack, in 1580, it fell within hours. Nevertheless, it is a major tourist magnet today. 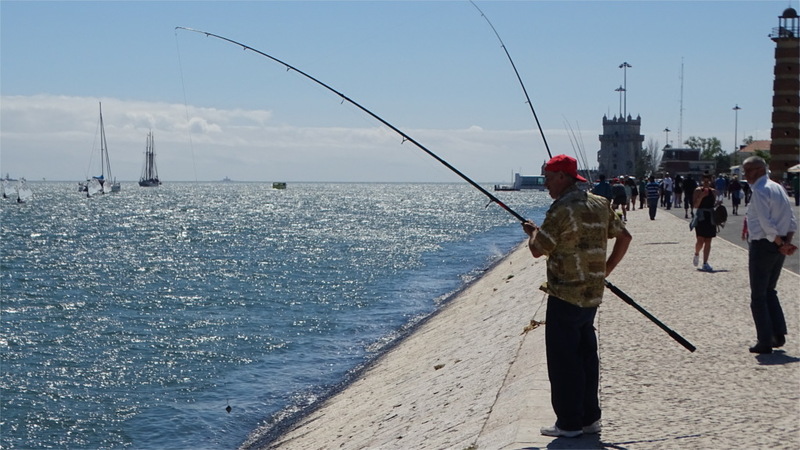 On weekends the promenade is full of people fishing for sport. I sat down at a cafe behind these people and had a coffee and an ice cream, without seeing a single one of them land a fish. The Family had taken a bus to come and visit this area while I was at work. After dropping her at the airport for her flight back, I had half a day left for my flight out. 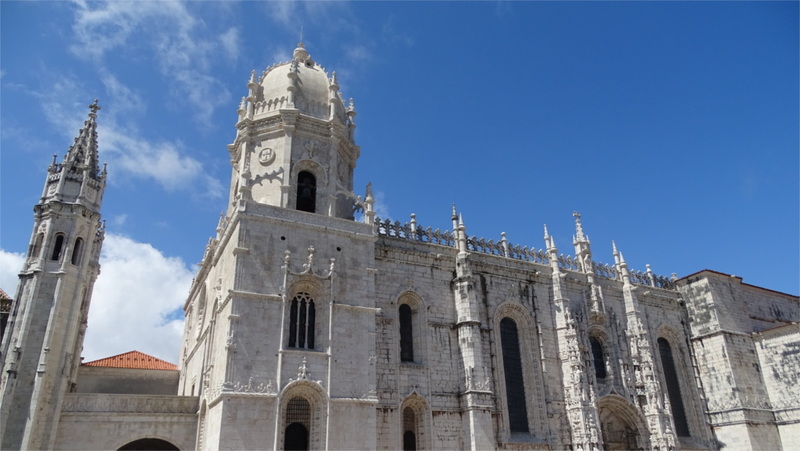 I decided to come to Belem to see the tower, the monument and the Jeronimos monastery. The easiest way to get here by public transport is to take the Metro up to Cais de Sodre and then the local train to Belem. If you have loaded your Lisbon Viva Viagem ticket with the zapping option then the same ticket can be used on both. The main thing to see here is the Jeronimos Monastery. It is said that before starting from Lisbon in 1497, Vasco da Gama spent a night praying at a church which earlier stood here. With the permission of the Pope, king Manuel I started building a monastery here in 1501. It was financed by a 5% cess on the spice trade, except the part which went directly to the crown. The enormity of the spice wealth can be appreciated even today, as you walk up to the enormous edifice, meant to dwarf anything on a normal human scale. What look like short queues from a distance eventually turn out to be pretty long by normal standards. It is possible to see the church free of charge. It is an imposing space (photo here), but the queues to enter are long. I decided not to take this option. 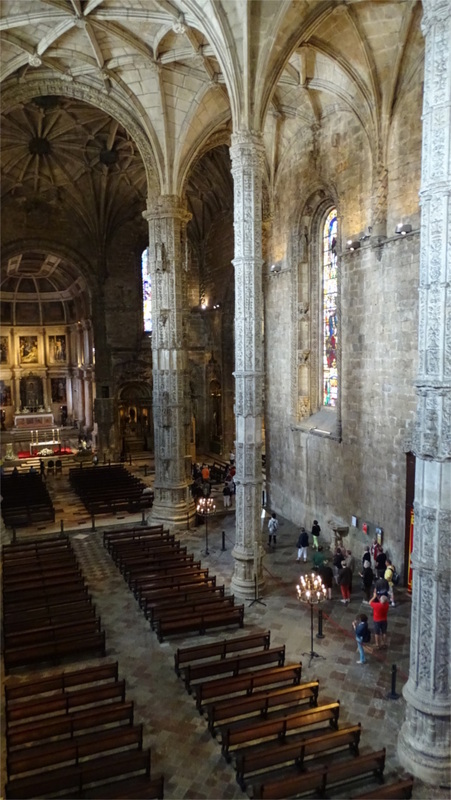 The other options are to buy a single ticket to the monastery, the monastery and the attached museum, or a ticket to all the sights in Belem. The last is clearly the correct option. 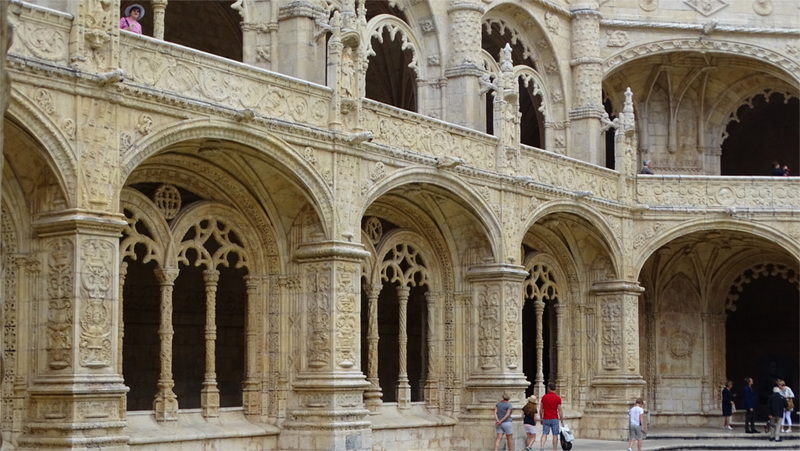 The monastery is an impressive example of the style known as Manueline. It is ornate and rich, and incorporates complex sculptures and maritime themes. A view of the wings surrounding the central courtyard (photo below) shows how overwhelming it can be. I walked into the courtyard and spent time looking at each arch separately. There is an incredible amount of detail, making it worth your time to look at it carefully. The photo above is one detail which you may miss unless you take your time. 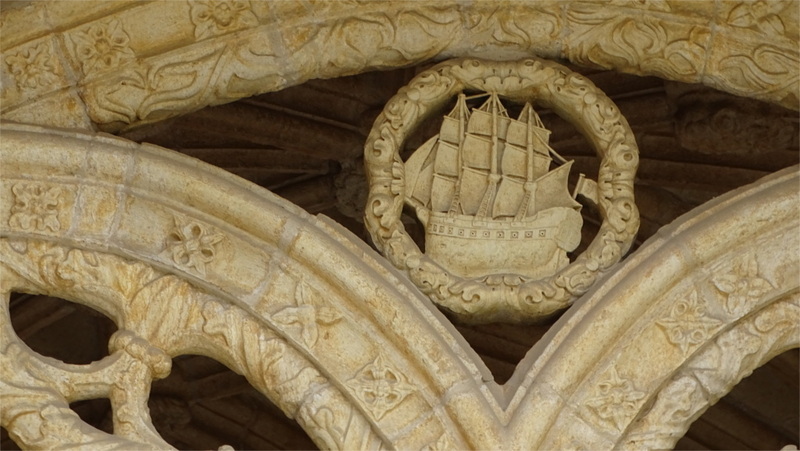 On top of one of the arches is this sculpture of a Portuguese carrack. This is the type of ship which Vasco da Gama commanded in his voyage to India. His armada also had a smaller and more agile ship of a type called a caravel. I could not spot a representation of a caravel, but the monastery is large, and I may easily have missed something. The next floor is equally complex and pays close viewing. Off to one side is a little gallery from which you can look down into the church. I spent a long time here with my camera looking at the details of the church so that I could avoid standing in another queue downstairs to see the same space from below. The museum attached to the monastery is also interesting enough. This is mostly about pre-Christian inhabitants of the Iberian peninsula. There was a section on the iron age settlers in the area. Some of the jewelery (see alongside) is spectacular. There was constant contact with other Mediterranean civilizations: Phoenician, Greek and Carthage. 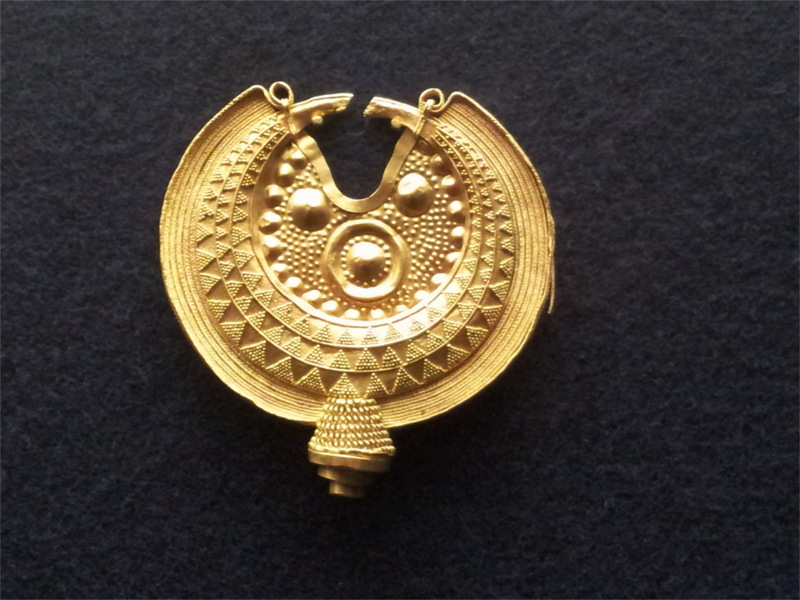 Some of the artefacts in this collection come from these contact. The later Romans, however, left extensive remains. It was interesting to see that the Mithraic cult is widely represented in the Roman remains in this area. 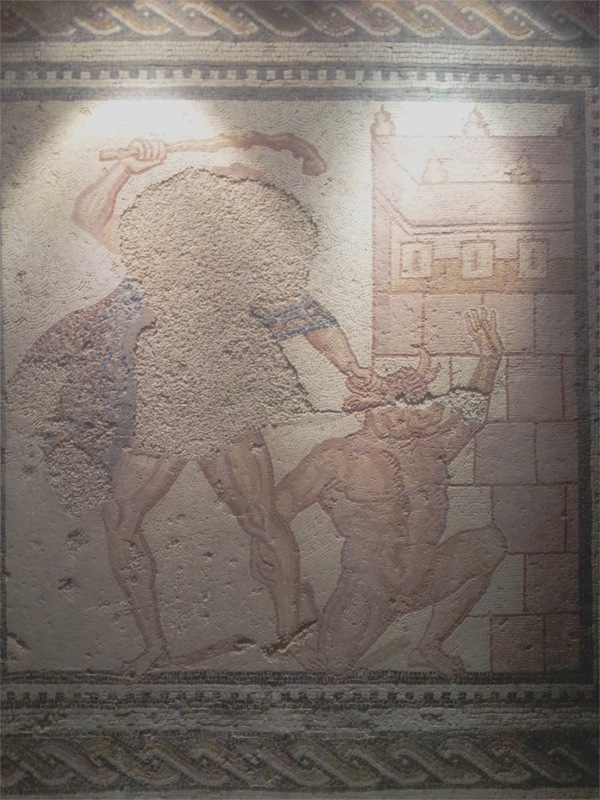 The mosaic alongside contains a central iconography of the slaying of a bull. It did not take me too long to walk through the museum, but it was worth it. The area is full of tourists, and therefore contains all the little conveniences and annoyances which attend on them. I skipped the ride on a carriage, and the over-priced bottles of water. But I was snagged by a kiosk which sold artisanal beer. I tasted a lager, and went on to catch my train back to Lisbon. 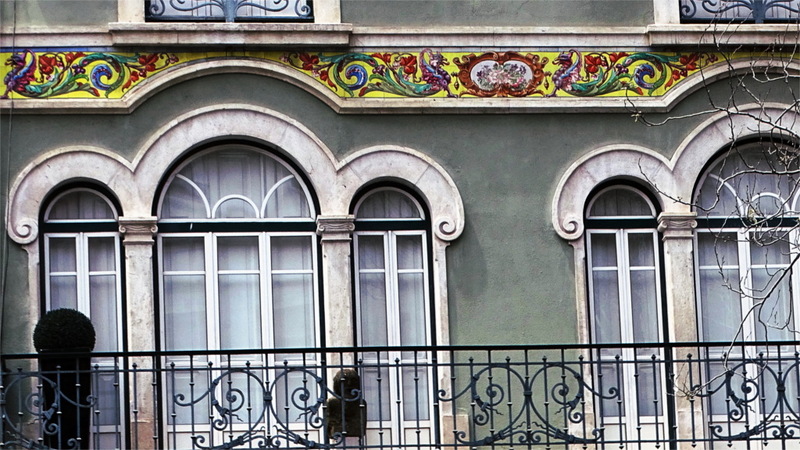 A very special thing about Portugal is that building frontages are full of tiles, called azulejos. In fact this is so special that there is a whole museum dedicated to tiles. We were to leave Lisbon for Coimbra by a train out of Santa Apolonia station, and I found from my map that the museum was very close by. So we checked out of our hotel, left our luggage in a very large storage locker in the station and took a bus to the museum. The museum is housed in a beautifully restored church. It’s about four stops away from the station. The bus driver was very helpful and told us exactly where to get off. The museum was right opposite the stop. The museum is stunning. 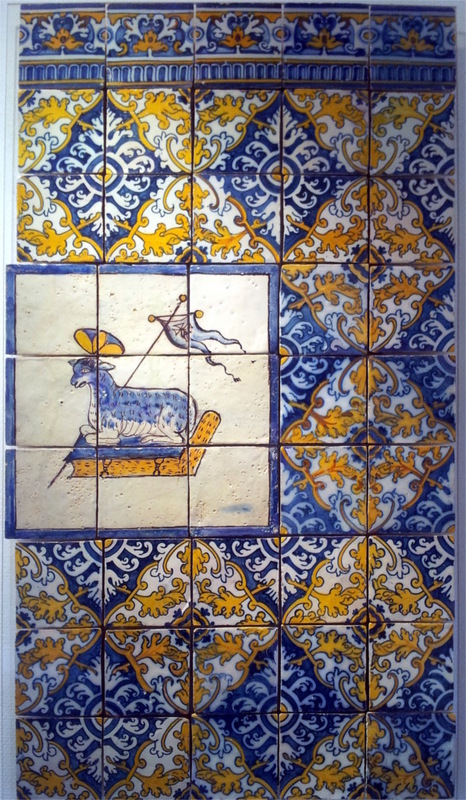 It starts with a series of exhibits which show how the tiles were made, and how the technology of glazed and painted tiles progressed. This first hall is followed by a series of brilliant old tiles. The first three images you see in this post come from the next two halls. The brilliant combination of yellow and blue are used in so many ways: not only to extend the geometric designs inherited from the Moors, but also to create paintings. 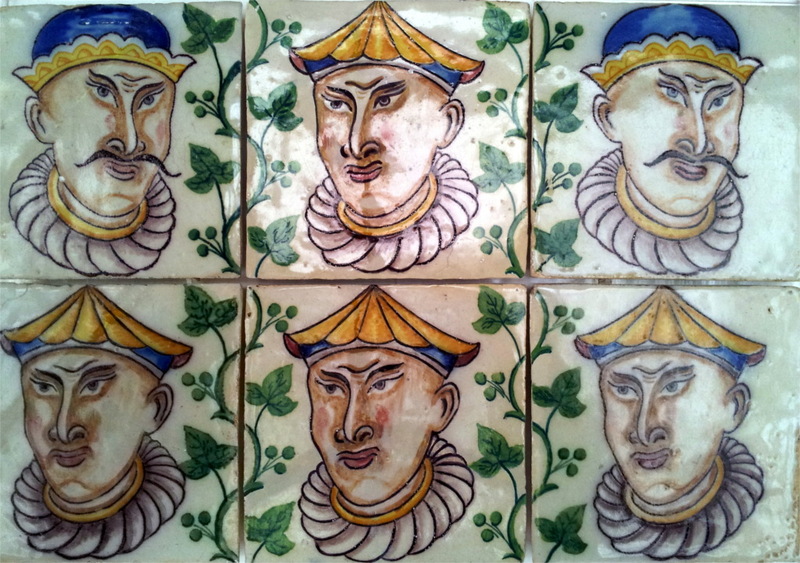 The human figures are not very finely done; it seems that there was a sharp division between painters and tile makers. However, the studies of flowers and birds and outstanding. One of my favourites was the elaborate panel pictured at the top of this post. This floor also contains a workshop which is closed to the public, and the elaborate chapel of the church. The gilded chapel with its tiles have been restored very well. After this one has to climb to the next floor. As one climbs, the yellow is lost from the tiles. 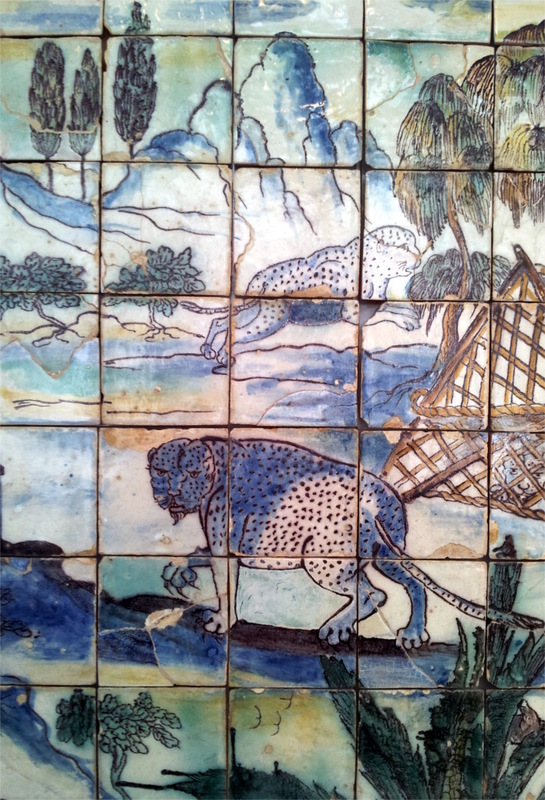 There are elaborate hunting scenes done in blue and white. 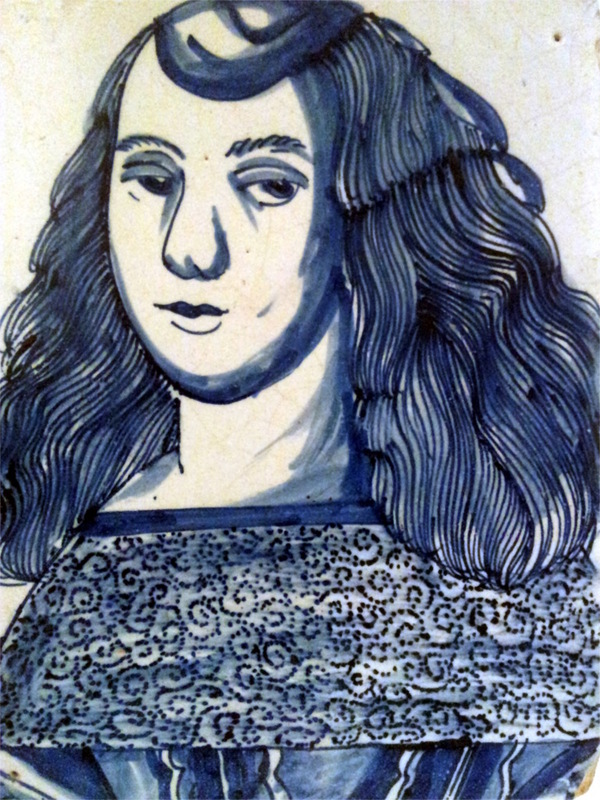 In a little chamber near the head of the stairs our eyes were drawn to portraits of Charles II of England and Catherine of Braganza (shown here). The political marriage between the two had many consequences, but the one which lasted longest was that the seven islands of Bombay went as Catherine’s dowry to England, and formed the seed of the megapolis which I live in. The hunting scenes continued through the next chambers. The discoveries which Portuguese soldiers made also found their way into these pictures. The one alongside shows leopards, although the draughtsmanship is suspect. Are they leopards or hyenas, or a non-specific savage animal? The posture looks like a hyena’s, but the face and tail is more like a leopard’s. There were similar confusions in other tiles from this age. 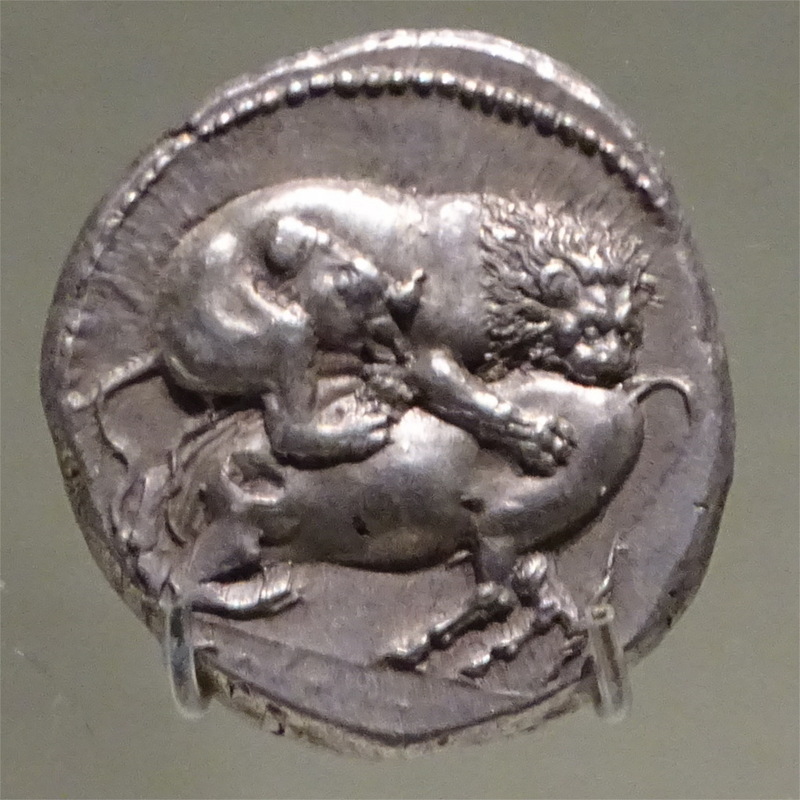 In one the relative sizes of lions and dogs were odd. This was possibly because the artists of this period drew fabulous beasts which they may not have seen or observed closely. Just before and after this period they draw flowers and birds which are exquisitely observed and executed. It seems that tiles were also used for instruction. There were a few tiles with technical drawings. Here is one which seems to illustrate some principle of map making. However, technical drawings are seldom self-explanatory. Even today, if you take a technical drawing out of a book, you lose its meaning. 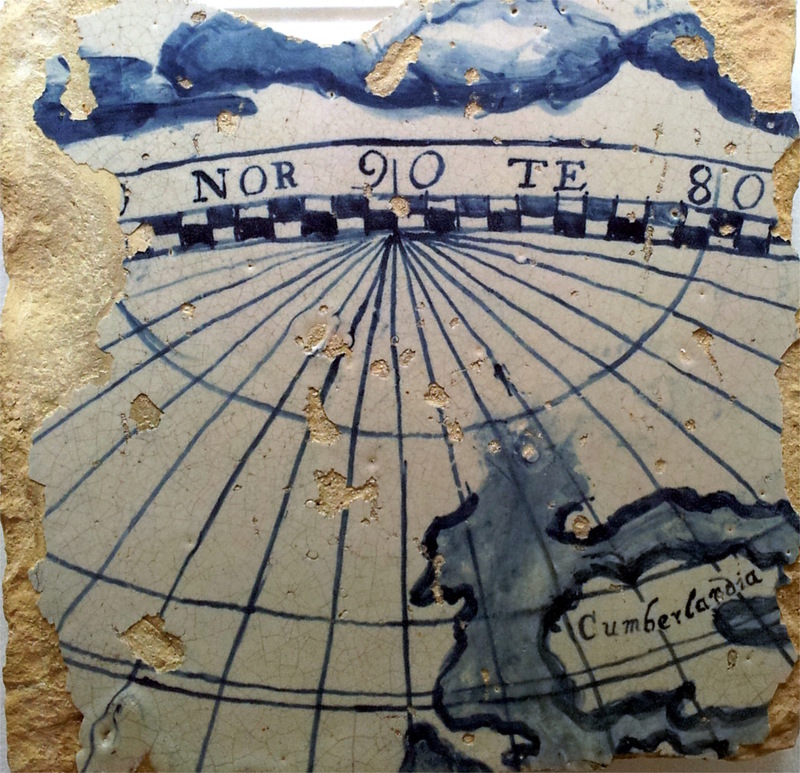 These tiles standing by themselves in a museum lose the cultural binding to working knowledge. 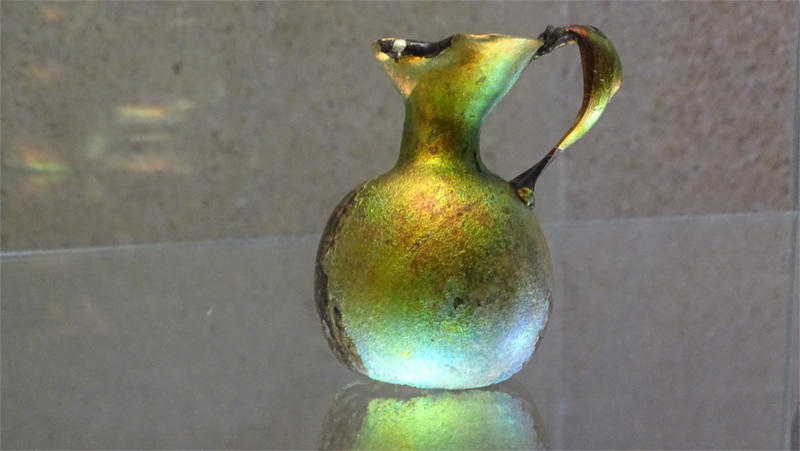 The last hall contained work by the artist Hein Semke, a German settled in Lisbon some time in the beginning of the twentieth century. The works on display showed a clear merging of German expressionism with the ceramics we had just seen. The Family and I thought that ceramics show a clear merging of technology and art, a trend that intensified through the last century and is commonplace now. 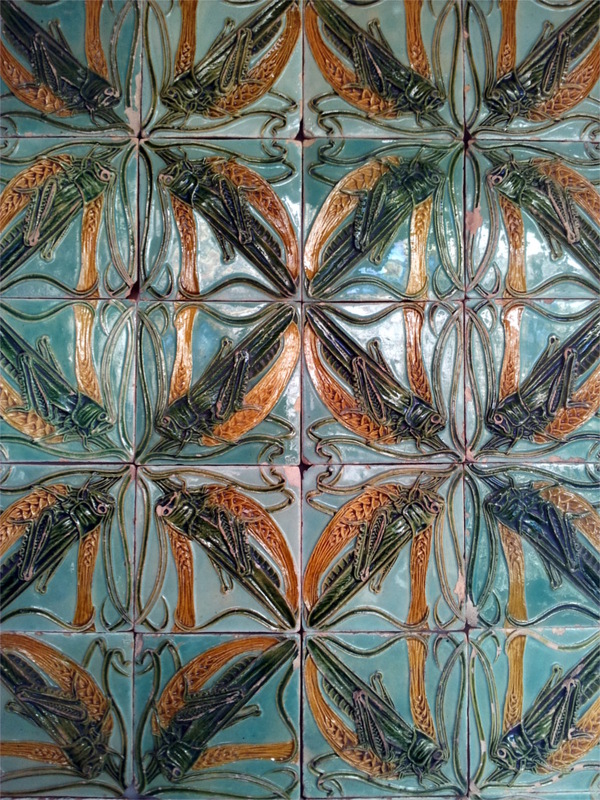 The modern ceramic tiles after this, like the locusts shown here, are further examples of art and technology coming together. 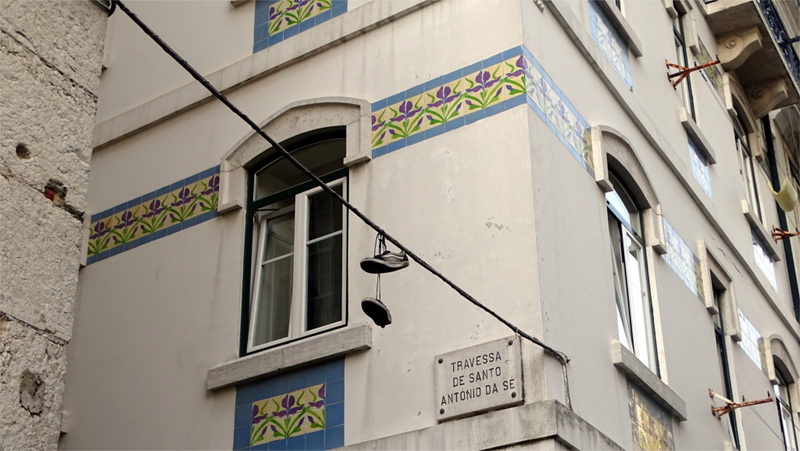 An upper floor contains a panorama of Lisbon in tiles. As we looked at it and realized how little of the city we had seen, we thought this was a perfect thing to end our trip to Lisbon with. It gives us incentive to come back. 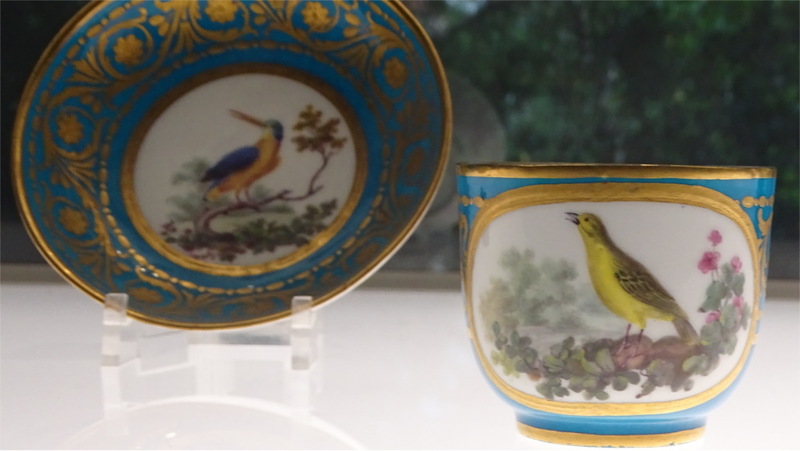 One of the museums in Lisbon which I’d read a lot about is the Calouste Gulbenkian museum. Gulbenkian was a British oil magnate of Armenian origin who died in the middle of the last century. During his lifetime he kept his enormous art collection in his house in Paris. Although he donated many pieces to the British Museum and the British National Gallery, a significant part of it belongs to the museum in Lisbon. The museum is housed in a stunning building which blends superbly with the surrounding gardens. The details of the design of the complex are described well in Wikipedia. What is difficult to convey is the aesthetics of the building. When you walk through the park and arrive at the entrance to the museum, it seems completely natural to skirt a duck which has settled near the door. One circuit of the museum takes you past Islamic art as well as antiquity from Mesopotamia, Egypt, Greece, Persia and Rome. The Egyptian section is small but has a few stunning pieces. 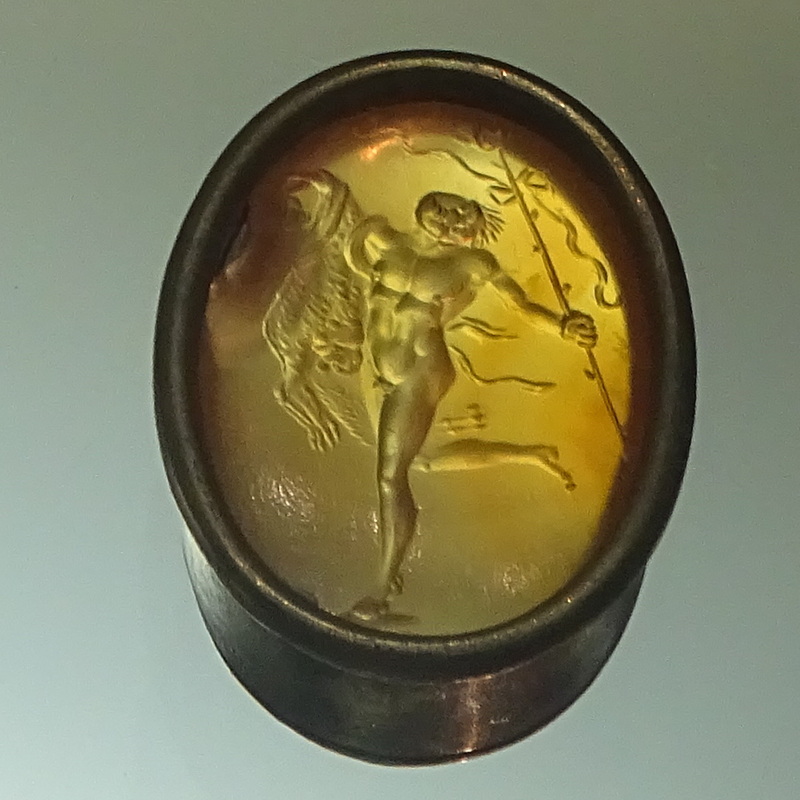 The Greek collection is remarkable: see the three examples above. The Islamic arts section gives possibly the best overview of this period among all the museums I’ve seen. The second circuit contains European art. After you see a Franz Hals, a wonderful van Dyck, a couple of Rubens and a Rembrandt in close proximity, you can wander in a daze through the rest of the museum. I woke up only when I reached the gallery of French furniture, mainly gilded Louis XIV and XV. I remembered my camera only when I saw the plates above. The collection ends with Art Nouveau and Deco. The Family and I left the museum talking about this alternate modernism which now only appears in a certain kind of science fiction movie. Walking around Lisbon one has a distinct feeling that people do not like one-way streets and the crazy traffic routing. 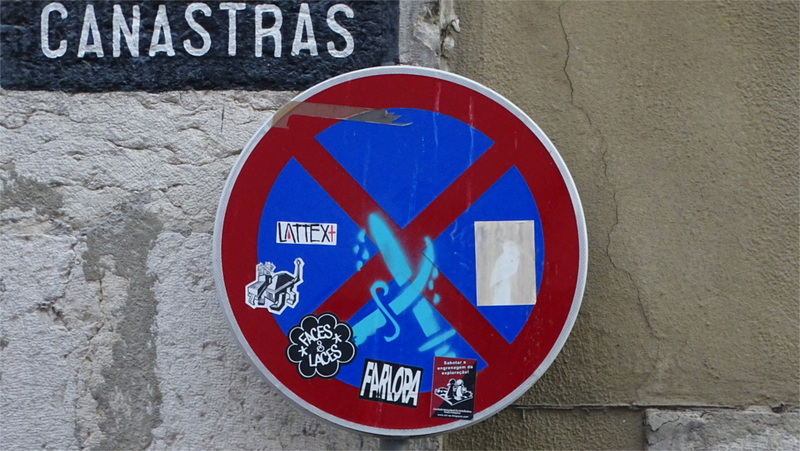 No entry signs are constantly vandalized all over the central part of the town. Every time we took a taxi we found that it would first go in a completely crazy direction. The friendliest of drivers would drop us at some street corner and say things like "Walk down that road and take the first left." Going to the doorstep presumably was just too round about. On the other hand, if you do not have no entry signs, you may just ride a bike up to a point of no return. Alfama is a highly atmospheric part of Lisbon. The city rises very sharply from the Tagus river. Our first view of Alfama came as we strolled along the riverside and reached the Terreiro de Paço metro station. The Family recognized the towers of the cathedral from the pictures she had seen. The building to the right in front turned out to be the Jose Saramago Foundation. 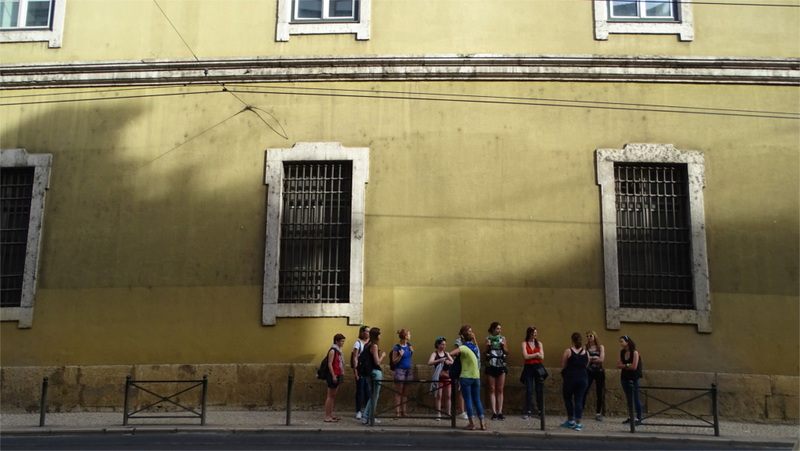 If we had more time in Lisbon we would definitely have gone for some of their events. We turned into this district, passed the Jose Saramago Foundation, and climbed up a little. There’s a warren of little streets, passages, and stairs leading up. We quickly lost our way, but decided to keep going upwards. I began to notice the abundance of graffiti. Later we came to love Portuguese graffiti; it will be the subject of a future post. Going up eventually brought us to the cathedral. As we climbed we stopped to admire some beautiful tiles embedded into buildings. We found that Alfama is slowly being renovated. The picturesque crumbling buildings are interspersed with fully renovated buildings like this one. 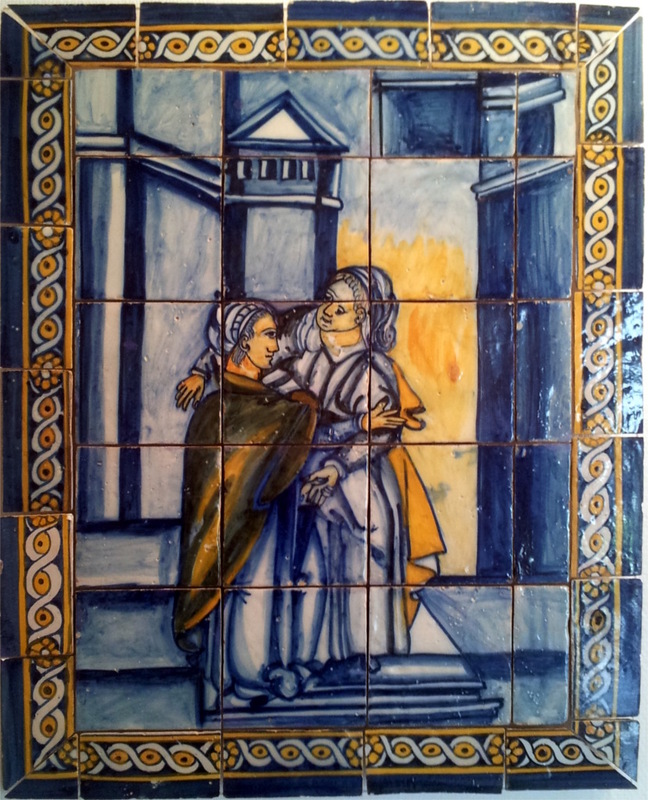 We had begun to notice tiles: azulejos in Portuguese. We would see much more of this soon. It turns out that Alfama is full of restaurants and Fado clubs. 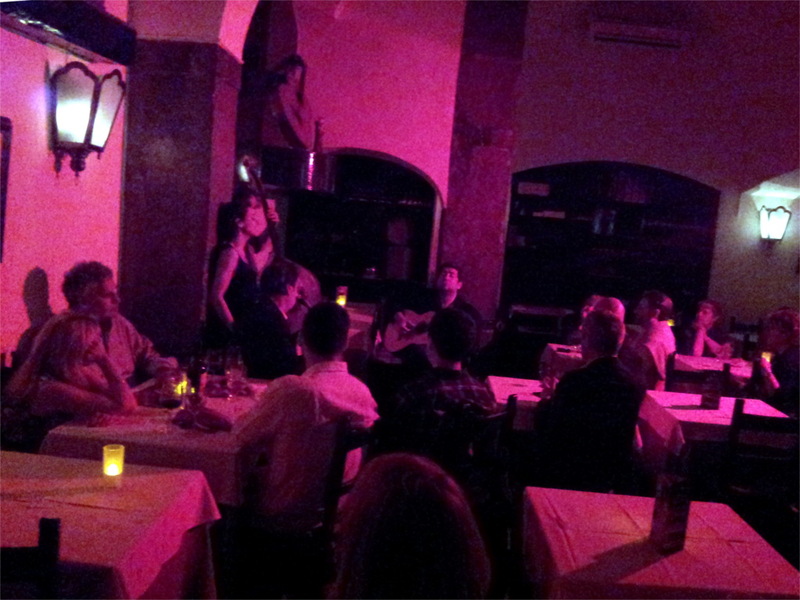 Later we came back to Alfama for the singular experience of listening to Fado. This musical form apparently has two different styles: the Lisbon style is said to begin with sailors, but now it is common for women to sing Fado of Lisbon. 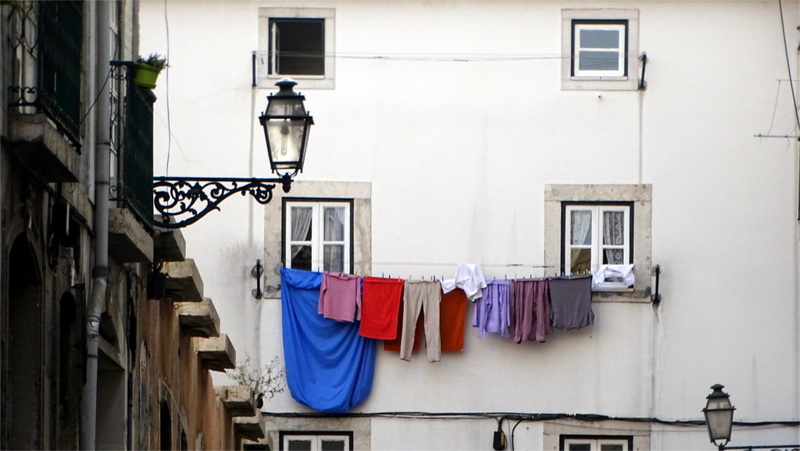 We heard a beautiful performance of this style in Alfama (photo here). Later we would encounter the Coimbra style too. We explored other parts of the city in the evenings, but Alfama with its very distinct identity was always the most predictably interesting. 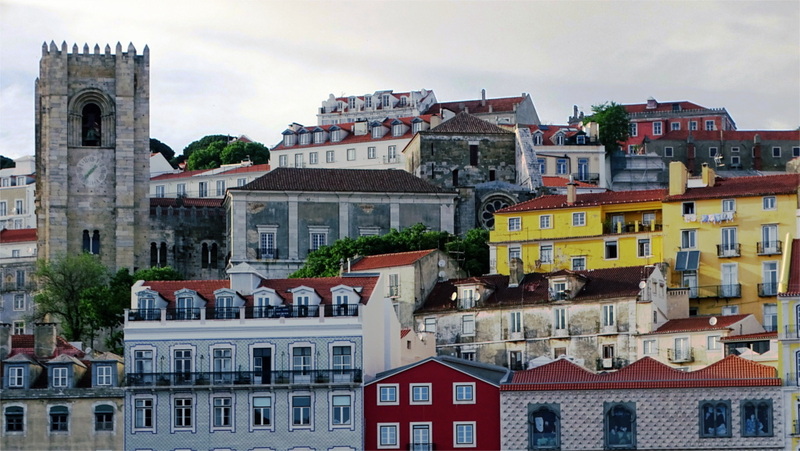 If you don’t know the secret ways of Lisbon just follow us and gravitate towards Alfama. 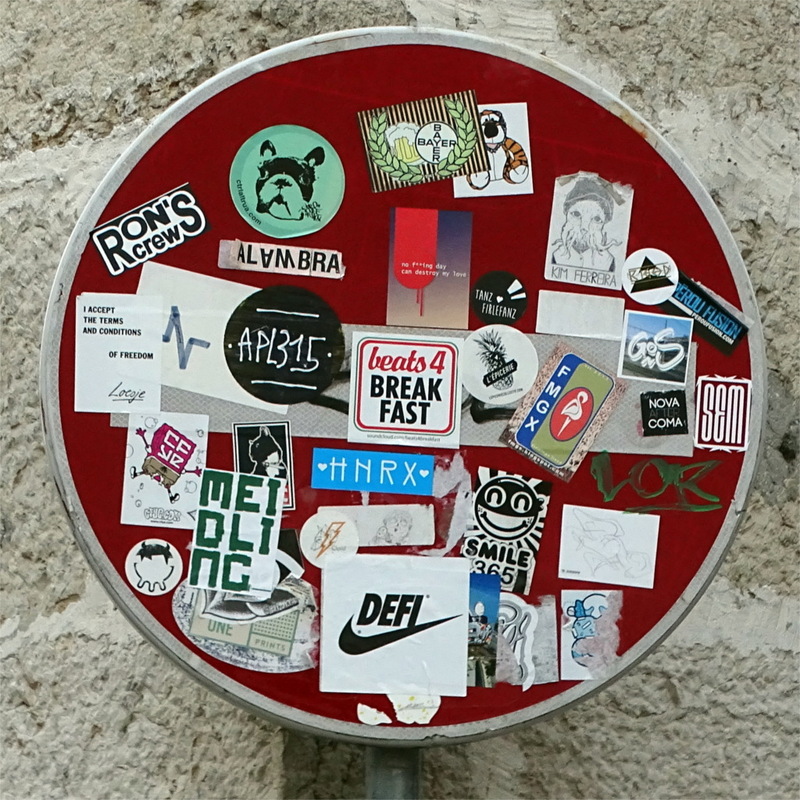 Lisbon seems to be in the middle of a slow renewal. Every cab driver we talked to told us the story of how Marquez de Pombal rebuilt Lisbon after the disastrous earthquake of 1755. He has a huge Praça named after him, with a statue atop a gigantic pillar. I wonder who will be deemed responsible for the ongoing renovations. The metro nearest my hotel in Lisbon was named after Marquez de Pombal. Before rushing off to work in the morning, I would sometimes have a quick breakfast at a pastelaria (bakery) on the way. I liked the busy atmosphere of the bakery. The coffee was good, and I liked the array of cakes to choose from. I was fascinated by the fact that the pavement in front of the bakery had its name done in mosaic tiles (see the photo alongside). Clearly the city had torn up the pavement to install these tiles, or allowed the bakery to do it. I thought this was pretty cool. As I had my breakfast, I watched the empty facade of the building opposite me being worked on. 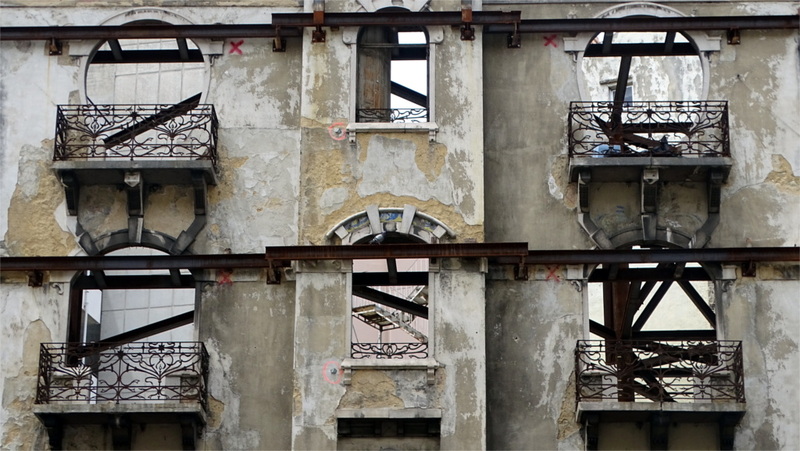 The rest of the building was gone, and one wall was held up by an ingenious scaffolding. I suppose that eventually a whole new building will come up behind this facade. Later, as I walked along the street, I wondered how many of these beautiful facades hide completely modern houses behind them. Probably it is only the shapes of the windows and doors which are old. 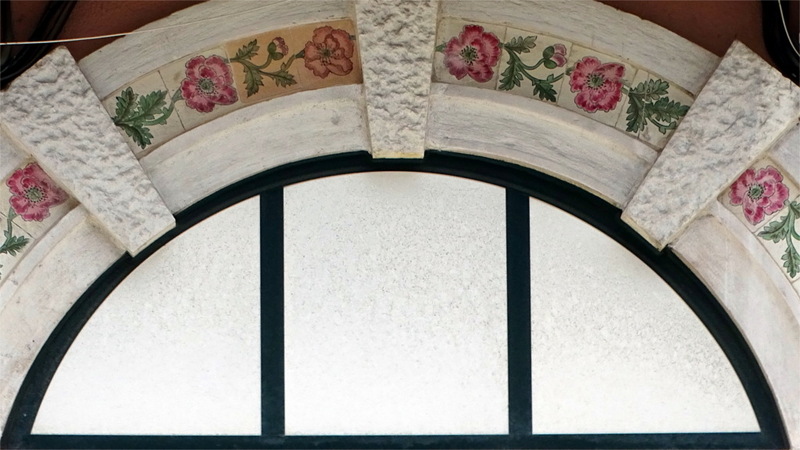 The beautiful tiles and plaster mouldings must have been added after the rebuilding, if one believes that the building under reconstruction is typical. I wonder how little authenticity this leaves to the very beautiful looking buildings. There wasn’t much time to prepare for the trip to Portugal. I read during my layover in Munich. 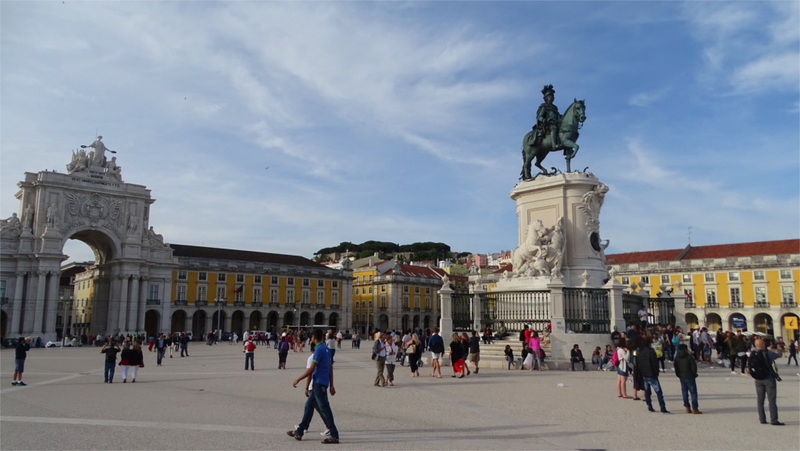 The historical entry point to Lisbon was the Praça do Comércio. We arrived on a brilliant Sunday afternoon and decided to go off to this square after a quick shower at the hotel. The Metro in Lisbon covers downtown pretty well. We got off at the station called Baixa-Chiado and walked. Past Praça Luis de Camoes we turned into the steep Rua Alecim, and walked down its length. The interesting building whose photo you can see above is just opposite a cafe. We were a little tired, and thought that some caffeine would do us good. 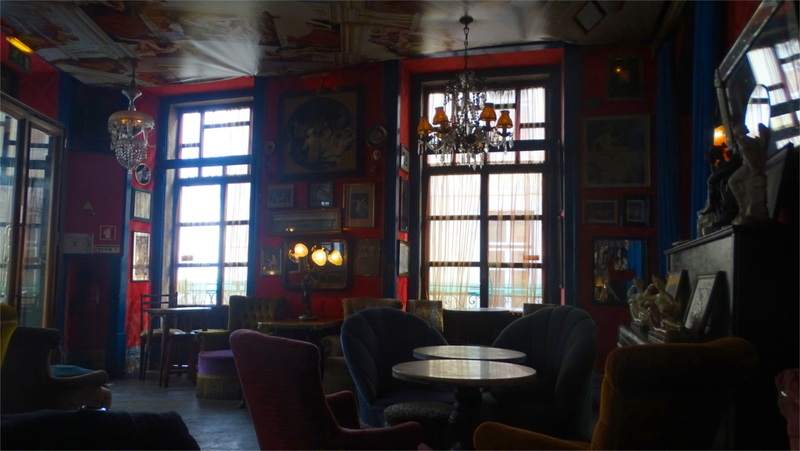 The cafe was such a beautiful hodge-podge of couches, tables, and odd decorations that it could well have featured in a movie (see photo alongside). We walked out fortified, and found ourselves in Cais do Sodré after a short walk. This was interesting, but not where we wanted to go. 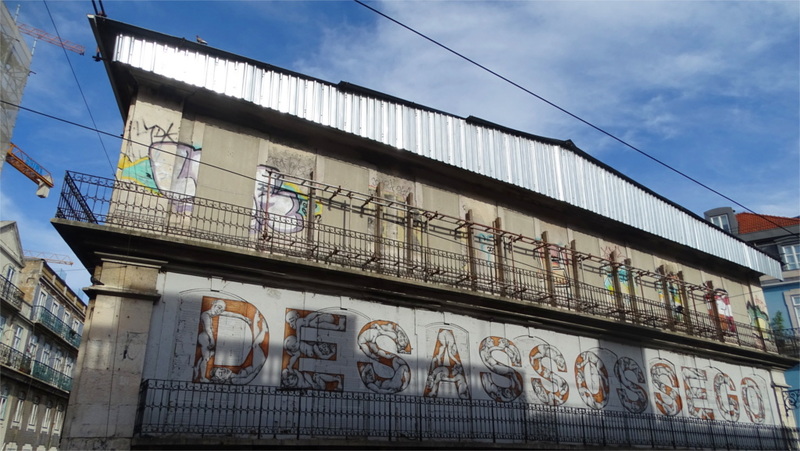 So we backtracked, and found ourselves walking along Rua do Arsenal. The evening sunlight made even blank walls look beautiful. The long street eventually brought us to the Praça do Comércio. There was a violent pillow-fight going on in front of the statue of King José crushing stone snakes. We sneaked past the skirmish and crossed the road to the Tagus river. The crowd here was a mixture of locals and tourists. After a brief halt at the river-front, and admiring the far-away Bridge of 8 May (named after the day of the revolt against the dictator Salazar), we walked to Terreiro do Paço. A little further on we could see the old cathedral, so we moved in towards the district of Alfama. We passed the Jose Saramago Foundation, and climbed up along a series of very picturesque streets. There was washing hanging from windows every now and then. 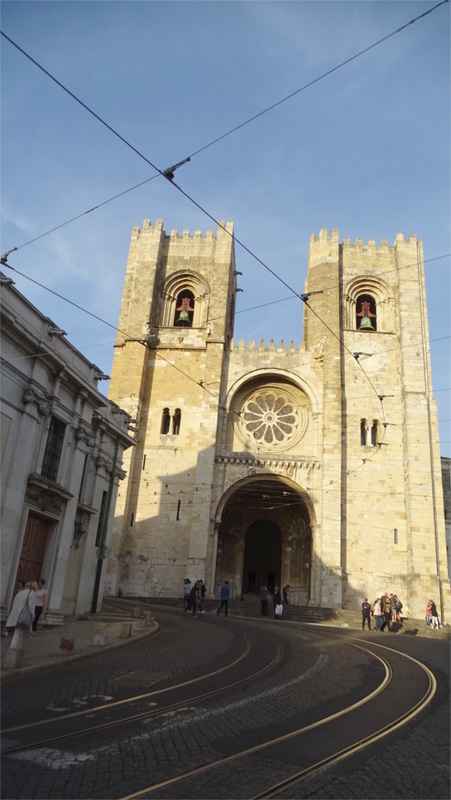 We climbed up a steep road and found ourselves right outside the Igreja Santo Antonio de Lisboa. We stopped for a quick look at the church, and then went on to the cathedral a few steps away. 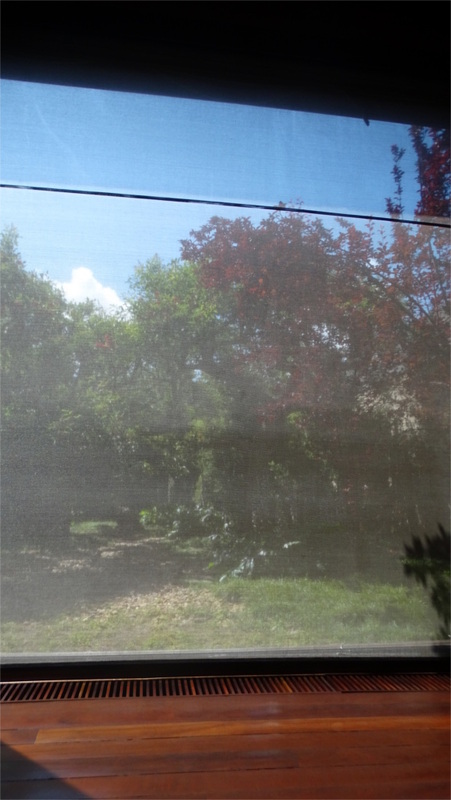 A picturesque tram thundered past us. We could walk past the church on a downward sloping road to reach the local Fado bars. We were too tired for this, so we took the other road at the fork. A few steps up and we saw a nice fish restaurant: one could see that it was nice by the number of people inside. We joined them and ended the first of our epic walks across the town. Arriving in Lisbon airport I was immediately struck by the laid-back atmosphere. I’d passed through Mumbai and Munich in the sixteen hours before arriving. Although Lisbon was much smaller than either, there was a cafe near the belt where you could wait until your baggage arrived. Mine came very soon. The Family was to catapult in within an hour. Why we’d taken different flights is a tale full of sound and fury which I might post about later. I wheeled my bag over to the airport station and got two Viva Viagem cards out of a machine. These rechargeable cards cost you a non-refundable 50 cents, and you can use it on all transport in the city, including the train to Sintra. It was still forty minutes till The Family’s flight touched down. There was a cafe right outside the customs exit. 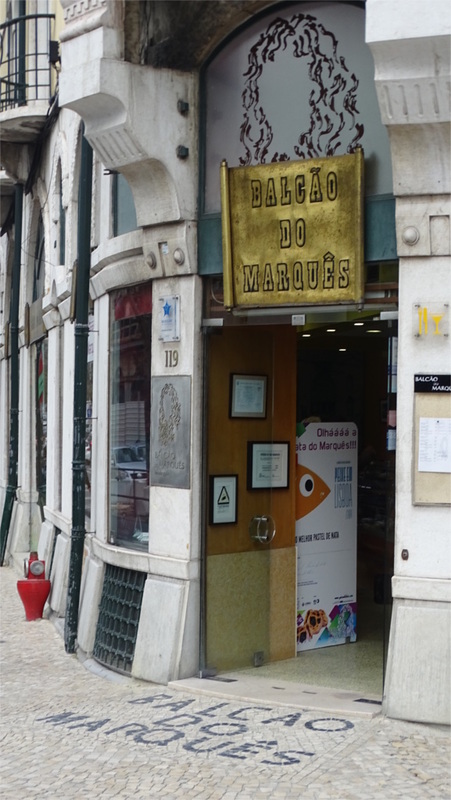 Lisbon in full of these convenient laid-back options. I got myself an espresso and a queque, billed as a Portuguese muffin, found a comfortable chair, and settled in for a wait. The photo of the cafe in the foreground, and the exit gate in the back ground, which you see above, was the view from my table. My host had warned me to take a taxi from the departure level since there’s a good chance that the arrival level taxis will try to cheat you. When the family arrived we asked the tourism office about taxis. They said that it might take about 12 Euros to our hotel and a prepaid taxi costs about 24 Euros! we took the bags up to the departure level and got into the first taxi which we saw. It is a short ride to town: about 15 minutes on Sunday afternoon. It cost us less than 10 Euros.